Paddling Otaku: Thoughts on Coffee, and Cups, and a Pack and Go! or Hell No! Thoughts on Coffee, and Cups, and a Pack and Go! or Hell No! I have been thinking a lot about coffee lately. There is a piece making the rounds of Facebook - which I am this close (his fingers are very close together) to quitting completely - about the joy of bad coffee. Folders crystals and the like. When I think about bad coffee I think about a backpacking trip I did with my brother 20 years ago in the Presidential Range in New Hampshire. We were camped on the backside of Mount Washington in the Great Gulf Wilderness which is rarely visited, and makes a good base to do day trips to the summits of the range. We made coffee by the liter each day, one for each of us. First we added the instant coffee, then a lot of sugar, and then the non-dairy creamy. We had a slush of powders in the bottom of our bottles. Then we added hot water, and it got, well, palatable. We realized the best way to drink it was ice cold, achieved by submerging it in a stream. After many hours of hard hiking it tasted wonderful. But after many hours of hard hiking everything tastes wonderful. The article about bad coffee goes on to talk about how we shouldn't be spending 20 minutes in the morning making coffee, when we could be doing something better with our time. It also claims that bad coffee is comforting, like certain foods. Both of these things are nonsense. The ten minutes I take to make a pot of french press isn't doing me any harm, and bad coffee is about as comforting as that exam all of us late 40's kayakers have to have. You know the one I mean. Add to this equation that I drink decaf coffee, which most coffee companies and baristas alike view as a waste of time. It is surprisingly hard to get a good cup of decaf coffee. I can't imagine how my father drank Sanka all those years. Most think decaf means we don't like the flavor or robustness of good coffee, which is untrue. I want good flavor, and a robust cup of coffee, I just don't want the caffeine. Yes, I know there is still some caffeine in my decaf. I am careful how I spend my money, but one of the areas I most want quality is the food I eat. I don't mind spending money on good beans to use in my French Press. I don't eat processed foods, I don't eat fast food, I am certainly not drinking fast, processed coffee beans. The other coffee related topic I have been thinking about is the cup. One of my paddling students works for a major coffee company. Once I got him on the water I traded him paddling knowledge for coffee knowledge. Did you know the most expensive part of a cup of coffee is the cup!? If I bring my own cup to Starbucks the deduct $.10 from the price of my coffee. The cup costs significantly more than that. The part that really gets to me about the cup though is how short its active life is. Paper is made and coated, which is then turned into a cup with a bottom, and a rolled lip. It is then shipped to a distributor that sends it off to your coffee shop. Then you order a cup of coffee, drink it for yen minutes and throw the cup away. It seems like a terrible waste. Yes, 160,000,000 coffee cups a day end up in land fill. But wait, how many of them get recycled you ask? None. None of them get recycled. You can't recycle a paper hot cup because of the coating on the inside. So bring a reusable cup with you, I leave one in my car. A nice one. This brings us to the Pack and go or Hell NO! for today. I recently bought a new insulated coffee cup. I have owned many over the years. Sometimes they break, sometimes they get lost. Sometimes the disappear into the void of missing gear. This is what I got recently. 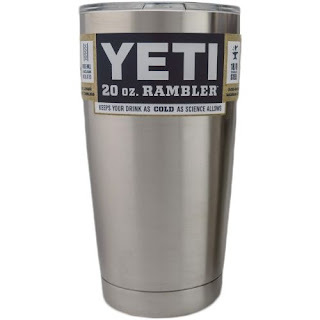 I know everyone is going Yeti crazy. Yes, they are very expensive. Yes, they are heavy. But their products work extremely well. I used a 45 liter yeti cooler on a beach trip a few months ago and was extremely impressed with how well it kept ice from melting. It was also amazingly heavy. I purchased this Yeti Rambler mug because it was recommended to me by a serious gear nerd. I paid $30.00 for a coffee mug. I'm going to let that settle in for a bit. Thirty Dollars. That is 300 ten cent savings (for bringing my own cup) to Starbucks. Which is about 8 months of coffee. That is a lot of money for a cup. This is also a ridiculously over engineered cup. Here is why it is worth $30. It works. It works really well. It works like burning your tongue and lips 2 hours after you put your coffee in it. It is a double wall vacuum insulated, stainless steel coffee cup, and is ridiculously priced and worth every penny. My only complaint is that the lid doesn't have a way to seal the sip hole. Other than that, perfect. This is without a doubt a Pack and Go! Situation. Okay, because It won't seal completely I won't actually take it on a backpacking or kayaking trip. But car camping? Hell yes. Daily commute? Absolutely. This is a sensational product.